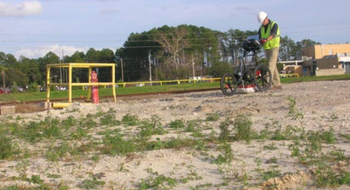 Several full-service utility surveying companies have contacted Ground Penetrating Radar Systems, LLC. over the years. The surveying companies are frequently looking for an edge over their competitors and ground penetrating radar can often provide that advantage. In this case we were contacted by a surveying company to mobilize to a paper mill located in Jacksonville, FL. The mill had an area roughly 250’ x 700’ in size that they wanted to survey to locate old utilities, concrete foundations, a live fire line, and a live water line. This area of the facility was extremely dilapidated and decomposing. Large abandon buildings, foundations, etc. were protruding from the ground and debris was scattered everywhere. GPRS is often faced with the challenge of surveying difficult terrain and this site was no different. On site GPRS methodically surveyed the area on a grid pattern to ensure that all utilities on site were found to the best of their ability. One of the benefits to using Ground Penetrating Radar Systems is that they pride themselves on providing skilled/expert ground penetrating radar technicians to every job site. This means that GPRS was able to accurately survey the area in question at the paper mill and mark the important findings; leaving the debris findings/anomalies unmarked. After completing the survey the Project Manager from GPRS worked hand-in-hand with the surveying company to make sure that they recorded the correct information and answered any additional questions they may have had. All parties included in this project were pleased with the output provided by the ground penetrating radar technology. 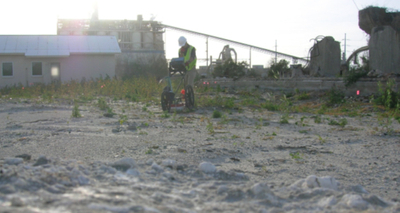 For the last 10 years, Ground Penetrating Radar Systems has specialized in locating professional private utility locating (as well as other types of ground penetrating radar) for surveying and construction use. If you would like more information about ground penetrating radar or to request a quote, please contact your local Project Manager.